The story doesn’t end when Jesus rises from the dead. Instead, it is only the beginning. Now the disciples have the task of sharing the good news with the world. They will face trials such as the jealous church leaders and jail, but they will have help from God so they will be victorious. Through this lesson children will learn that we can never stop telling others about Jesus and that God will help us along the way. Learning Aim: Tell Others About Jesus. You will have the kids act out this story as you tell it. Part 1 (Acts 5:12-16): Have the kids walk around the room and tell each other about Jesus. Talk about how exciting it is that Jesus is alive and how happy you are that many people are being healed from their sickness. Talk about how more and more people are hearing the good news about Jesus and believe that He is alive. Part 2 (Acts 5:17-18): A teacher who is the ‘high priest’ arrests all the people who are talking about Jesus and puts them in jail. Have all the kids sit under the table or in one certain area when they are in jail. Talk about how the high priest was jealous of Jesus and so he put the disciples in jail. Part 3 (Acts 5:19-21): Have another teacher or student be the angel. The angel will let the disciples out of prison and tell them to start preaching again. The disciples will start preaching again. 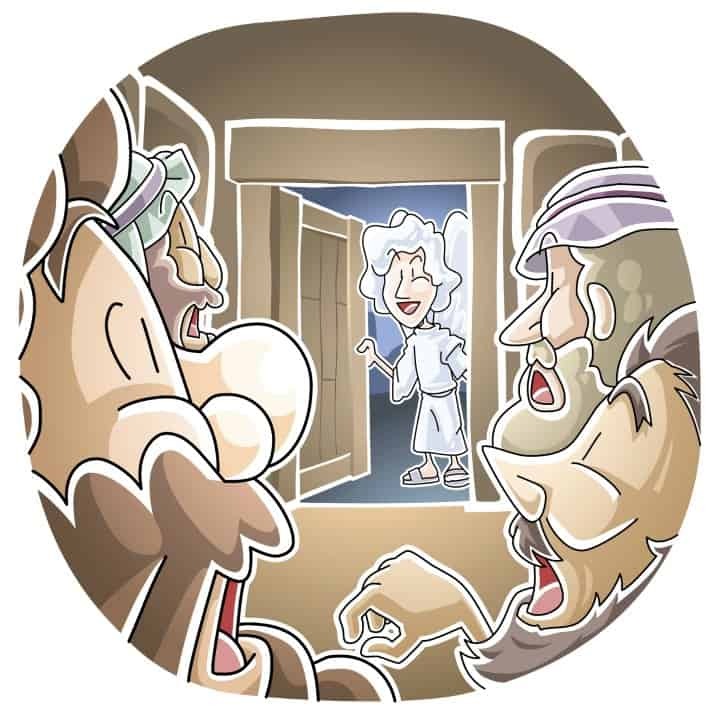 Part 4 (Acts 5:22-42): The high priest and the guards will look for the disciples because the prison is empty. The high priest will be angry that they got out but lets them go. Say, You all did a great job telling the story of how the disciples got out of prison! The disciples could never stop telling people about Jesus, even when they were in prison. We should always tell people about Jesus as well! Ask, You might just be one person, but if you keep telling others about Jesus it’s like a chain reaction. We have to keep telling others about him until everyone knows! Let’s play a game with dominoes now that shows what it’s like to keep telling others about Jesus. We stand them all up in a line and when we knock down the first one the rest just keep going as well. We need to be like dominoes and keep telling others about Jesus until everyone knows. Let the kids stack up the dominoes and knock them down as long as they are interested. While they play talk about how they can start their own chain-reaction to tell others about Jesus. Draw a picture of the disciples in prison. Tape ribbons or string across the page to look like bars of the prison. While you work say, People put the disciples in prison but God wanted them to keep talking about Jesus so He sent an angel to set them free. Jesus is alive and that is really good news! We must always tell others about Jesus. Use tape or string to draw zig-zag lines on the floor. Have the kids take turns walking the lines while saying Jesus is alive. Say, No matter where we go we must tell others about Jesus. Where are some of the places that you can tell others about Jesus? Make a list of all the places that they can tell others about Jesus and encourage the kids to share Jesus with others this week. Have everyone sit together and share their favorite part of today’s story. Encourage them to share one person that they can tell about Jesus this week. Close in prayer. Tony Kummer (Editor) reviewed & updated this page on : April 8, 2016 at 11:09 am. All our content is peer reviewed by our readers, simply leave a comment on any post suggest an update.